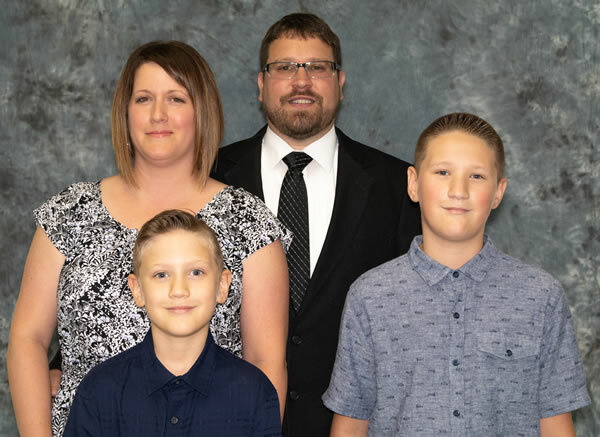 "A Few Words of Introduction"
For the past five years, I have had the pleasure of serving as the associate pastor of my home congregation, the Briery Branch Church of the Brethren. My calling there has been a real blessing, and has given me great opportunities to learn those skills needed to be a good pastor. I have had the chance to practice ministry within, and without the church setting. Most importantly, it has allowed me to affirm with certainty my calling into pastoral ministry, as well as to give me the practical opportunity to serve God, the church and its people. This "assurance of my call to ministry" was one of the first things that I shared with the Moscow search committee. I believe that I have been called to serve God a a pastor. In one capacity or another, I am certain that God will continue to use me in this way. Along with me on this journey has been my faithful wife of nine years, Deborah. She has been a real partner in my calling into the pastoral ministry. Her devotion to God has allowed me to explore my calling into ministry. She also is the mother of our two beautiful little boys; Isaac 6, and Ayden 2. Their entry into the world was not without worries. From the beginning, their well-being has been a miracle of prayer and love. Both boys were born premature. They each spent extensive time at the University of Virginia Medical Center. Through it all, Deborah's love for the boys taught me the definition of devotion, commitment, and sacrificial love. Her presence continues, along with the boys, to be a real undergirding for my ministry at Briery Branch. I have been truly blessed with Deborah and the boys, and value them as one of God's greatest blessings in my live. I learned to appreciate community and relationships as a young person in the church. Growing up, my family participated in small, rural churches that cared deeply for the core values that the Bible teaches. The first church that I remember was the Mt Olivet Brethren Church in Mt. Solon. Although they were not Church of the Brethren, they did preach the gospel in its entirety. It was there that I came to know Christ in my life. Little did I know then how much a part of my life He would become. Eventually my family left that church to join my dad's family at Briery Branch COB. It would be there that I would spend much of my youth and teenage years learning what it meant to be "Christian". I became active in the youth programs and gave my life to Christ and was baptized. Soon I became an active member of the Church body. It was through this body that I would eventually be called into one of the greatest journeys I would ever know: serving God, the church, and his people as a pastor. I completed the Shenandoah District Christian Growth Institute in the fall of 2007 and was given the opportunity to serve as an associate pastor. One June 1st of 2008, I accepted the position, and was ordained into the ministry as the associate pastor of Briery Branch COB. I learned visitation, grief counseling, anointing, preaching, teaching, as well as officiating in marriages and funerals. I have worked closely with the Logos program, which is for all community kids, 1st thru 12th grades.